If you think you’ve heard all the great electric guitar styles in the world, think again. This Saharan sand-blizzard of fine-crushed glass will grind your face to a bloody pulp. 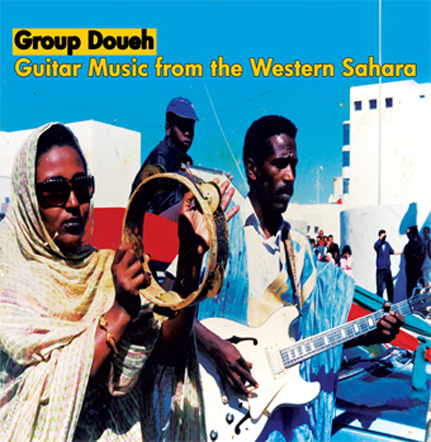 Group Doueh play raw and unfiltered Saharawi music from the former colonial Spanish outpost of the Western Sahara. Doueh (pronounced “Doo-way”) is their leader and a master of the electric guitar. He’s been performing since he was a child playing in many groups before finally creating his own in the 1980’s. Doueh says he’s Influenced by western pop and rock music especially Jimi Hendrix and James Brown. His sound is distorted, loud and unhinged with an impressive display of virtuosity and style only known in this part of the world. His wife Halima and friend Bashiri are the two vocalists in the group. Saharawi songs are from the sung poetry of the Hassania language. The music is based on the same modal structure as Mauritanian music, however, Doueh’s style is a looser appropriation infused with a western guitar scope, one that relies, in his words, as much on Hendrix as it does traditional Sahrawi music. It also adds a playful pop element that rarely filters through in this region. Doueh has turned down countless offers from Morocco and Europe to release his music but he decided to offer us access to his homemade recordings and photo archive for this amazing debut LP. This is a one-time pressing of 1000 copies, the first Sublime Frequencies vinyl release. Pressed on 180 gram vinyl and comes in a gatefold full color jacket stocked with great photos of the musicians and liner notes by Hisham Mayet.